These are the best Wells Fargo credit cards we've come across. Find out which is right for you. With a 0% intro APR for 18 months on transfers and purchases, a no annual fee, and a free FICO® Score this card is a standout in the balance transfer category. This card one of the largest cash sign-up bonus we've seen for a no-annual-fee card. It's relatively low spending threshold to unlock the bonus is great for low spenders looking to pocket an easy bonus. Wells Fargo hasn’t always been at the top of the credit card rewards game, although they’re not exactly at the bottom either. But with the introduction of a number of valuable rewards credit cards, the issuer packs in what’s common among the best credit cards on the market, it’s clear the issuer is ready to compete. Before you jump into a credit card application, read everything you need to know about Wells Fargo here in this guide to the issuer. 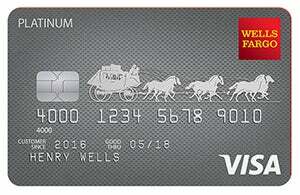 What are Wells Fargo points worth? Which Wells Fargo credit card is right for you? We look for credit cards that provide high-value perks and benefits. These can include sign-up bonuses, high ongoing rewards rates, 0% introductory APR offers, travel perks, insurance, and credit score tracking or credit building. On the flip side, we seek to minimize the costs of using a credit card, which includes looking at annual fees, foreign transaction fees, ongoing APRs, balance transfer fees, and security deposits. Of course, some credit cards offer benefits that make paying a small fee worth it. The point is, we want you to come out ahead, not the credit card companies. I'm a finance writer who has written over 1,000 articles on how to make your money work for you, and we’ve been featured on AOL, Yahoo!, and MSN. I've spent hours analyzing over 6,000 data points and 300 credit card offers to help design our credit card philosophy here at The Ascent. Not to mention, as a credit card enthusiast, I have personal experience with many of the cards recommended. Wells Fargo offers a number of different credit cards suited for different types of consumers. Take a look at your money goals and spending habits, and use the definitions below to decide which type of credit card might be right for you. Credit cards that offer travel rewards are a great option for folks who travel frequently or want to travel more often. They typically offer a higher rewards rate for certain travel-related purchases, and the rewards you’ll earn come in the form of points or miles that can be redeemed for travel. Some travel credit cards even come with specific perks and protections that are relevant for travelers. The best cash-back credit cards offer a good cash-back rate on every purchase you make. Some offer a flat rate, such as 1.5% back, on all purchases. Others offer 1% back on regular purchases but a higher rate, such as 3% to 5% back, on purchases within certain bonus categories. Cash-back rewards are preferable for people who like easy-to-redeem rewards or aren’t interested in traveling. While balance transfer credit cards don’t always offer rewards, they do offer some of the best 0% APR introductory offers. These credit cards allow you to transfer a balance from another account (usually with a balance transfer fee) and then pay off that debt with a 0% interest rate for a set period of time. As long as you can pay off your balance before the introductory period ends, balance transfer credit cards are a great way to pay off debt quickly and save money on interest fees. You’ll need a good credit score (ideally, at least 670 or above) in order to receive approval for most Wells Fargo credit cards. In addition, Wells Fargo does have some idiosyncrasies worth mentioning. It is typically much easier to receive approval if you’re already an existing Wells Fargo customer. To become a Wells Fargo customer, all you have to do is set up a checking account with them. If you’re applying for a Wells Fargo credit card with a sign-up bonus, you won’t qualify for it if you’ve opened another Wells Fargo credit card in the past 16 months. That being said, there doesn’t seem to be any hard limit as to how many Wells Fargo credit cards you can have at one time. If you also have the Wells Fargo® Visa Signature® Credit Card, you can combine your points and redeem them at a rate of $0.015 each for airfare instead of the flat rate of $0.01 each. Wells Fargo offers two types of rewards credit cards: cash back and travel rewards. The former program is pretty self-explanatory. The latter program, dubbed Go Far Rewards, works on a points system and is what we’ll explain here. Wells Fargo’s rewards program does offer some flexibility. First, their cash back and points rewards are actually interchangeable. One point can be converted to $0.01 in cash back and vice versa. If you want to redeem your points for travel through their travel portal, you can book anything from airfare to hotels to tours. You can even combine points and cash, so you don’t always have to have enough points for the trip you want to take. You also have the option to redeem for gift cards. Unfortunately, the flexibility offered by the Go Far Rewards program is limited. Points are not transferable to any airline or hotel partners, and you can’t use them to “erase” travel purchases like you can on other credit cards, meaning you can only book what’s available through the travel portal. Finally, your points can expire after five years. Choosing the best credit card for you is going to maximize your Wells Fargo rewards. There are a few things you can do on top of that to earn even faster. Use the Wells Fargo shopping portal -- Like most credit card rewards programs, Wells Fargo has a shopping portal with a number of major retailers offering point bonuses on your purchases. Pool your points -- Wells Fargo makes it extremely easy to share your rewards with family members, friends, and coworkers at no cost. You can even start a Go Far Rewards pool with a group of people and collect points together to achieve a common travel goal. Apply together -- If you apply to one of Wells Fargo’s rewards credit cards with a spouse, partner, or friend, you can both earn the sign-up bonus. The fact that it’s both easy and free to transfer your points to any other cardholder makes this an easy way to double your rewards and split a vacation. While Wells Fargo’s Go Far Rewards program generally offers a flat rate redemption value, there are ways to get more out of each point you earn. Pair up with the Wells Fargo Visa Signature® Card -- Go Far Rewards points earned with this credit card are worth $0.015 each, or 50% more, when redeemed for airfare. You can pair this credit card up with one of their other rewards cards and transfer all your points over to this account for added value. Redeem for airfare -- If you don’t have the Wells Fargo Visa Signature® Card, it doesn’t matter what kind of travel you book. However, if you do, the travel portal will give you a big discount on airfare when booking with points. That’s because the 50% point bonus associated with the Wells Fargo Visa Signature® Card only applies to airfare redemptions. Pay attention to gift card discounts -- Many rewards programs offer a horrible point value for gift card redemptions, but Wells Fargo’s $0.01 per point for gift card redemptions is not bad. Even better, they regularly offer discounts on gift cards. Each credit card offers different benefits and rewards. In order to help you get a better idea of the differences between Wells Fargo's rewards credit cards, we’ve provided the table below. None of these credit cards have an annual fee. If you’re still stumped as to which Wells Fargo credit card you should get, consider the following questions. Do you qualify for a Wells Fargo credit card? You’ll need a good credit score to qualify for most Wells Fargo credit cards. If you don’t think you have a chance at qualifying, you shouldn’t apply for any of the cards listed above. Credit card applications result in a hard pull on your credit report and can temporarily affect your credit. If you have bad credit, all hope is not lost. You should consider applying for a good secured credit card to help you build your credit. Do you currently have high-interest debt? If you currently have high-interest debt, especially if it is credit card debt, you shouldn’t be focused on credit card rewards. Instead, your primary priority should be paying off your debt. As long as you have good credit, you can use the Wells Fargo Platinum Visa card to do a balance transfer that will help you pay off your debt more quickly and at a lower interest rate. Keep in mind that you will have to pay a balance transfer fee of 3% on the balance transferred (if transferred in the first 120 days, 5% thereafter), so do the math to make sure this deal is worth it. If the balance you’re currently holding has a high interest rate (think 10%+), it’s likely worth it. Only transfer an amount you think you’ll be able to pay off in 18 months, as the introductory period will end after that and you could end up with an even higher interest rate than you started with. Do you spend enough on dining and travel? If you’ve paid off all your credit cards and have a good credit score, you’ll want to consider one of the Wells Fargo rewards credit cards. This list includes a cash-back option and a travel rewards option. As explained above, Wells Fargo points and cash back are interchangeable, so you don’t need to focus on what kind of rewards you want to earn. Instead, you’ll want to focus on your spending, and which credit card will help you earn those rewards more quickly. 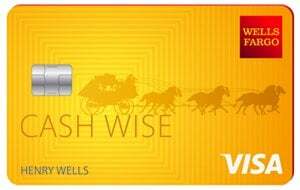 The Wells Fargo Cash Wise Visa® Card is essentially a flat rate cash-back card that rewards all spending equally.